FeedWordPress is an Atom/RSS aggregator for WordPress. It syndicates content from feeds that you choose into your WordPress weblog; the content it syndicates appears as a series of special posts in your WordPress posts database. If you syndicate several feeds then you can use WordPress’s posts database and templating engine as the back-end of an aggregation (“planet”) website. I’ve given this a quick test here: johnj (glew login needed, get one while it is hot!) where I’ve aggregated two of my blogs, my flickr stream and audioboo. The only one that doesn’t work too well is the audioboo one as the plugin does not grab the attachment. I’ve only given this a quick test, but it seems to work very well. There are lots of options for adding categories or tags to posts from a particular feed too. This could be used for either collecting things from a variety of publishing platforms to one blog, or perhaps be the holy grail for teacher struggling with the current glows e-portfolios: collecting all of your pupils post in the one place. The current glow solution of this is to have a list of links in glow that the teachers can click on to visit blog. I’ve told as many folk as I can that it is better to save a folder of bookmarks in their browser and open in tabs but this is not ideal. FeedWordPress will handle a lot of blogs over in DS106 is pulling in over 500 blogs and spitting them out in lots of interesting ways (for example Dynamic OPML Files Generated from FeedWordPress). For those interested in e-portfolios Glew also has the Mahara ePortfolio System, open source e-portfolio and social networking software built in. My blogging seems to have hit a all time low. I think this is mainly because I used to blog about my classroom practice (with some iPhone, web tech and the odd AppleScript thrown in). I was never one for educational theory I am afraid. I now don’t have a classroom to practise in and blog about. Anyway I am going to start a wee Glow post and see what happens. 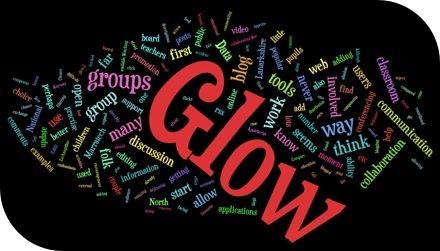 I’ve blogged about glow before but never had the chance to use it in the classroom. Over the last few weeks I’ve watched North Lanarkshire teachers and pupils start to use glow in practise and have been involved in helping with some of the training. So far I’ve seen glow have a remarkable effect on some teaching and learning in the first schools to get on board. Teachers have been setting work on glow, children posting work and commenting on other pupils work, locally and further afield. Classes have joined and contributed to National groups and in one case I know off a teacher created a national group within about a week of joining glow. There seems to be a real appetite for getting children involved in all sorts of online collaborating. One of the favourite activities seem to be the use of Marratech video conferencing through Glow Meet. This is a little ironic as North Lanarkshire has run its own Marratech server for several years. Although this has been used for many projects I think there has been a significant increase in video conferencing in the first couple of months of glow. I am beginning to think that the most important aspect glow is the way that online collaboration and communication receive promotion and support. There is top down encouragement that is being met by great enthusiasm, almost as if folk have been waiting for the tools unaware that they were already available. Watching folk take their first steps in glow also highlights some problems with glow and perhaps some pointers for Glow 2. I’ve watch a fair number of people click the cancel button to start all over again by accident. There are a number of similar examples. The editing of pages in glow is quite a laborious process compared to many web 2 applications there are many examples of slicker interfaces. Compare adding an rss feed to glow and to, say netvibes. Editing information in glow usually seems to involved lots or page reloads and then some scrolling. Groups are hierarchical and difficult to find, interesting groups may be buried inside others. The ability to search group descriptions and the tagging of groups would help this. Some sort of way of filtering and organising groups is needed. Recently I found a group discussion in glow asking for suggestions for glow 2. I posted a couple of comments but there is very little discussion on the board, perhaps because folk cannot find it? One of the strengths of Web 2 applications is the way many of them allow syndication and distribution of data, I can have flickr update in my blog, recent posts from blogs listed in a wiki and so on. At the moment RSS in glow relies on 3rd party scripts or widgets. The is no way, as far as I know, of getting information out of glow in an automatic way. It is hard t ofollow the work of groups you are interested in and no simple ways to share what a group are doing. Some of this is due to the overriding concern for security but glow does allow for public facing html webpages so the idea of some of glow being open to the public is not beyond the pale. It would be good if Glow 2 was in some way modular, allowing users and groups to add popular and useful open source components, making them private or open to the world. So a group could have a wordpress blog, a phpBB discussion forum, a choice of cms, wikis VLEs etc. etc. Adding the ability for glow to update and add modules would also make Glow a work in progress, in perpetual Beta, rather than a fixed toolset. I don’t think this is to far fetched, at the moment glow will allow secure access to lots of external content. If this could be expand to give users a choice of the tools it could be wonderful it would help with some of my GUI and data exchange wishes too. We, in Scotland, have an amazing opportunity in Glow which could be even better. The vision of a national collaboration and communication space for education.. The promotion and support of this collaboration and communication.. When the dust settles we have the best tools for the job, and tools that we can swap at will as better ones come along..
I’d be interested to know what other users have on their glow 2 wishlist? Or if you know where the best place to discuss this would be? Top image http://www.wordle.net/ with this post’s text.